Every day, Watch This offers staff recommendations inspired by a new movie or TV show coming out that week. This week: In honor of the Olympics, and the Olympic-themed episode of NBC’s Superstore, we’re revisiting our favorite episodes about intra-office competition. 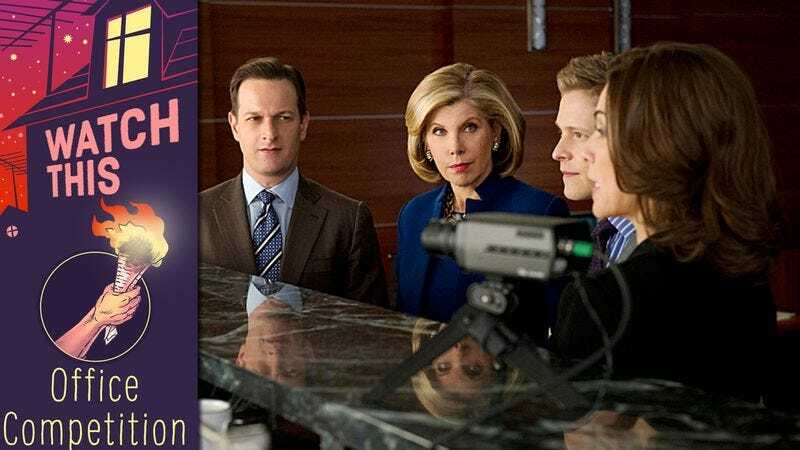 The Good Wife was never a traditional legal drama, and its refusal to settle into a familiar groove is precisely what makes it so compelling. Creators Robert King and Michelle King prided themselves on blowing up the courtroom procedural by putting its attorneys in novel scenarios requiring ingenuity and improvisation. Episodic stories could focus on a good old-fashioned jury trial, but they could just as easily involve professional review boards, military tribunals, ethics commissions, and all manner of quasi-judicial forums. In most scenarios, there’s a client whose life will change forever based on the outcome. But in “Red Team, Blue Team,” one of The Good Wife’s best episodes ever, the case has the most profound impact on the lawyers, not their clients. The Lockhart/Gardner firm is hired to represent the makers of Thief, an energy drink chock full of caffeine and heart-pumping herbs, which allegedly contributed to the death of a teenager. The client is mulling a settlement but wants to see how a trial would play out, so the firm conducts a mock trial with Alicia (Julianna Margulies) and Cary (Matt Czuchry) representing the “plaintiff,” while their bosses Will (Josh Charles) and Diane (Christine Baranski) represent the client. “That sounds… fun,” Alicia says, her voice colored by pleasant surprise. But Diane emphasizes that the mock trial is serious play. “The client will know if you’re going at half-speed, so come at us hard,” she says. For the client, everything about the trial—the details, the lawyers, the jurors, and the judge—are all real, and only the outcome is fake. But for the lawyers, it’s exactly the opposite. Everything about the case is pretend, but the divisions and grievances it exposes between the attorneys are very real, with ramifications that extend far beyond the mock trial. What begins as a fierce-yet-friendly competition between colleagues quickly devolves into a civil war, with Alicia and Cary furious about the firm reneging on their promise to promote several associates, and Alicia and Will still navigating the dissolution of their intra-office, extramarital affair. In no time flat, the colleagues go from pretending to oppose each other to actually feuding. It’s no ordinary competition, though, because all of the competitors know each other’s strengths and weaknesses. Alicia, for instance, knows exactly which coquettish gestures will distract Will and scramble his brain during an important line of questioning. All’s fair in love and mock war. “Red Team, Blue Team” is a brisk, thrilling hour of television that demonstrates not only the show’s ability to create tension and stakes, but also its mischievous sense of humor. In what might be the show’s funniest scene ever, Cary questions the “mother” of the victim, an actress he and Alicia hired for the exercise. The red team asks the actress to give a subtle performance evoking the steely grace parents who have lost a child often have. “I got this,” the actress says. Suffice it to say she swings for the rafters. The scene emphasizes the point that even contrived scenarios can go off the rails in a very real way. Availability: “Red Team, Blue Team” is available for streaming on Hulu, Amazon Prime Video, and CBS All Access, and can be purchased digitally and on DVD.